Station and crossing keepers hut. 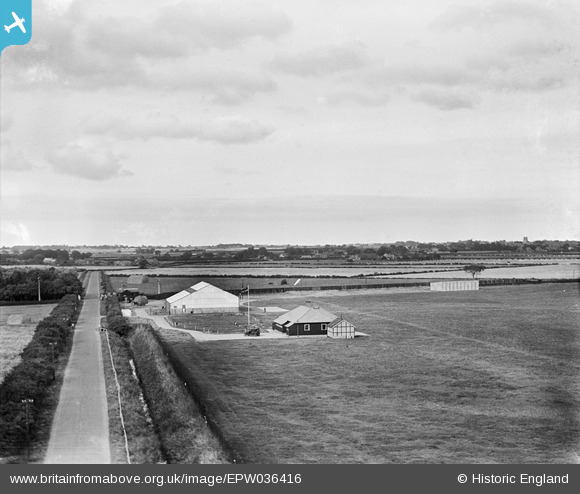 Flying at Hull (Hedon) Aerodrome goes back to before World War I. In 1916 the site was used as a night landing ground by 33 Squadron RFC, but there was little flying activity. In 1929 The Hull Flying Club was established and Hull Municipal Airport was opened by Prince George on 10 October 1929. KLM operated a service to Amsterdam from May 1934. Civil flying ceased on the outbreak of World War II, but the aerodrome was rejected by the RAF mainly because it was so close to the oil tanks at Salt End. Post-war there was little interest in flying at Hedon and a speedway track was opened with the hangar being converted to a grandstand. The venture failed. A last attempt to bring aviation back to Hedon ended disastrously when the aircraft was damaged on landing from a demonstration flight.